Depending on where you live, you’ve probably seen white-tailed deer in the wild. In fact, in some parts of North America, deer can be found in suburban neighborhoods. They might even jump a fence to visit your backyard! Deer are herbivores and they’re constantly looking for snacks. All About Deer: In some parts of North America, deer can be found in suburban neighborhoods. Native Americans hunted deer for their meat, skins and sinews. When settlers came, they hunted the deer so much that they were almost extinct. Today, there are many deer in the U.S. In the summer, deer live in woodlands or fields. In the winter, they move to forests for protection from the cold. If people cut down forests to build houses, deer have no place to go. They are more likely to move into parks or backyards. Male deer grow antlers every year. The antlers fall off in the winter. Male deer are called bucks. Females are called does. Male deer grow antlers every year. The antlers fall off in the winter. Female deer cannot grow antlers. 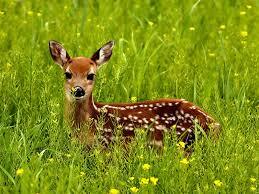 Does (female deer) have one or two babies in the spring or early summer. The babies are brown with white spots. Bobcats, coyotes, and mountain lions prey on deer. In some countries like Ireland, deer have no predators and their numbers have to be culled (cutback / managed due to over population) by government agencies. 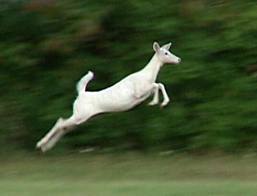 Deer can run up to 30 miles per hour to escape. 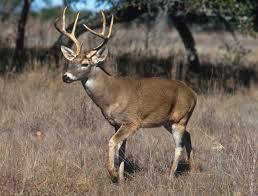 Whitetail deer can jump up to 15 feet. Males sometimes fight over females. Moose and Caribou are part of the deer family. Moose are the largest species of deer. Globally there are over 60 species of deer. Antarctica is one of the few regions deer cannot live due to the freezing cold conditions. Deer are very good swimmers. Deer have great hearing and a fantastic sense of smell. Their eyesight is not so great, they are believed to be colorblind and see objects at a lower resolution than we do. 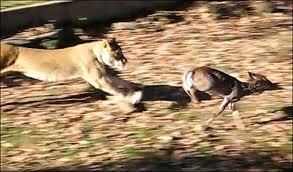 Deer can run up to 30 miles per hour to escape. They can also jump 30 feet. Bobcats, coyotes, and mountain lions prey on deer. Deer eat almost any plant. A footage of the first few minutes of a new born baby deer. Question: What do deer eat? 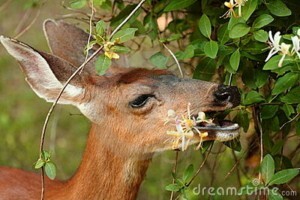 Answer: Deer eat almost any plant. They graze on grasses, but they’ll also eat the bark of young trees. They especially love berries or vegetables from your garden. Answer: Deer are usually shy and timid. If you feed them, though, they might lose their fear of people. They are sometimes hit by cars when they cross roads. It’s best to watch deer from a distance. Enjoyed the Easy Science for Kids Website all about Deer info? Take the FREE & fun all about Deer quiz and download FREE Deer worksheet for kids. For lengthy info click here. Declan, Tobin. " Fun Deer Facts for Kids ." Easy Science for Kids, Apr 2019. Web. 21 Apr 2019. < https://easyscienceforkids.com/all-about-deer/ >.